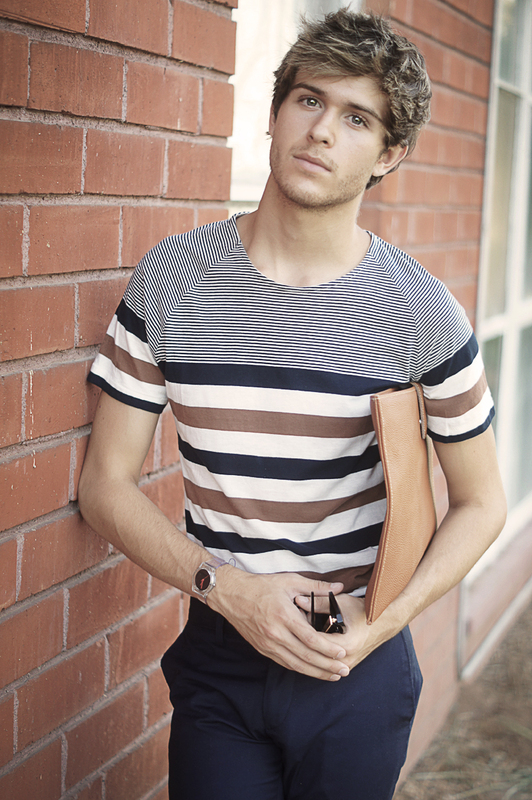 Stripes for the season | GALLA. I’ll admit, being present at the Marc Jacobs show gave me a mind-flood of inspiration. Up until then I wasn’t a big fan of stripes, but his intricacies and uniqueness put into the design opened my eyes completely. I came across this H&M tee that was offered in an array of different color combinations but this one in particular caught my eye. The palette was slightly nautical, yet slightly autumn…sometimes a challenge to capture. The marriage of the desaturated brown and midnight blue was easy on the eyes, so I snagged it. And here I paired it with the Invisible Mans watch, Andy Warhol sunglasses, Mick Jaggers “formal” trousers, and an envelope something Elton John would bring to a meeting I suppose. Not bad right? spectacular simply look adam, you create very beautiful compositions with simply clothes. perfect! 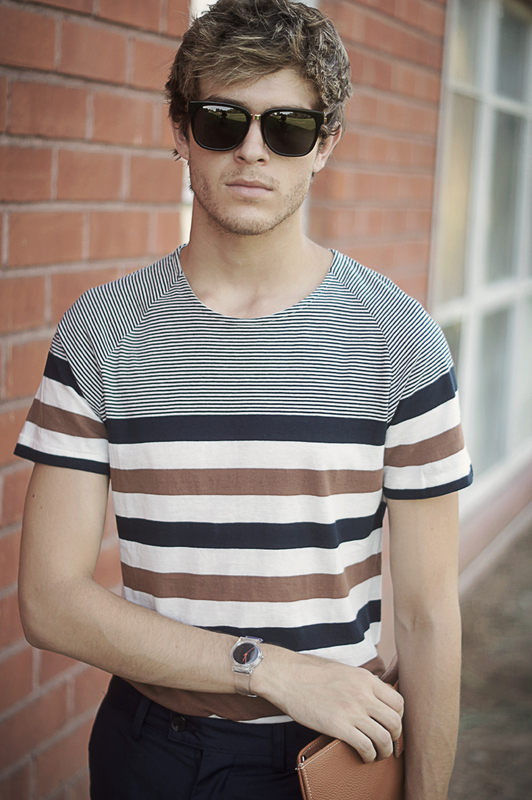 Love the stripes + the fresh simplicity of your outfit!! 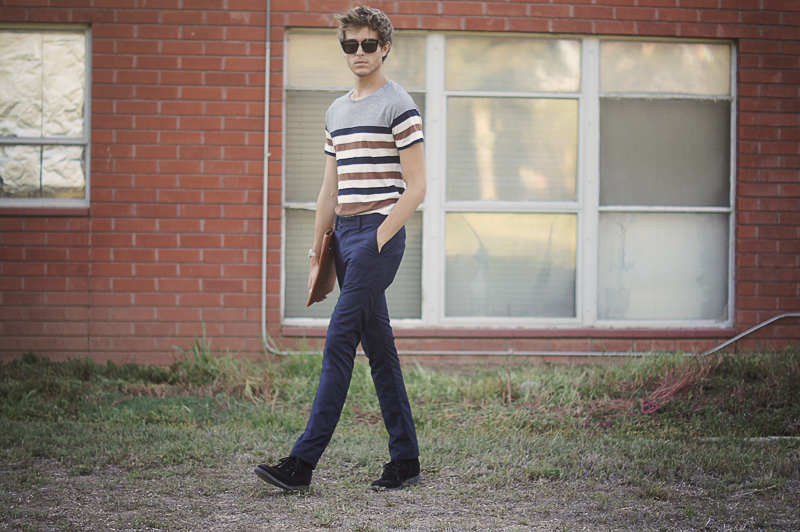 Stripes are so “in” this fall and it seems to be all I’ve been wear. Good look. LOVE classic stripes, and these have a little twist to them with the variation in color & size. You look great, as always! You seem so mysterious with this look !! Not bad at all! I’m rocking stripes today aswell, loving it. This style reminds me of the Country Road Brand. Great outfit, very classy and perfectly worn. Love it, the shirt is really nice! 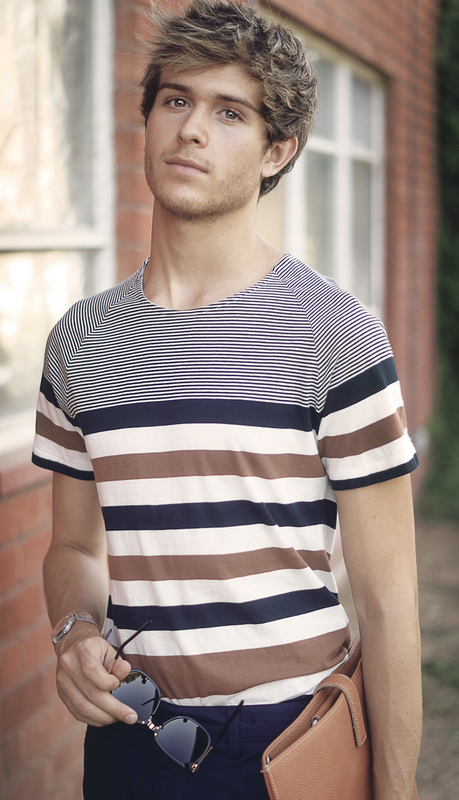 I love this comfy casual outfit, you need to do more of this, you look really yummy in stripes! Haha Glad to see I’m not the only one obsessed with stripes!